The 17th century Palazzo della Civiltà Italiana has been transformed into the luxurious Palazzo Fendi, which holds within its walls a Fendi boutique and the first ever Fendi hotel. Founded in 1925 in Rome, Fendi is an Italian luxury fashion house renowned for producing exquisite fur and leather goods, shoes, fragrances, eyewear, timepieces and accessories. 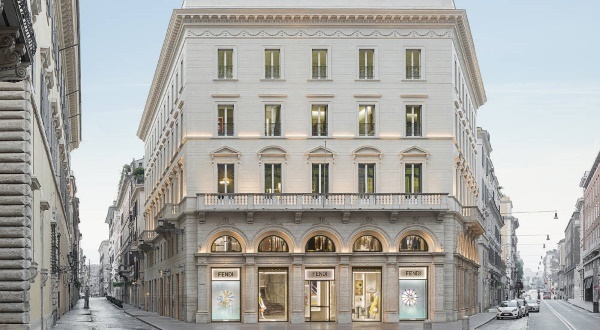 Fendi dedicated itself to the tremendous renovation of the historic Palazzo building after moving its headquarters to the Palazzo della Civiltà Italiana in November 2015. Located in the heart of Rome, the gorgeous landmark is a testament to Italian architecture and has been masterfully rejuvenated by the Italian luxury fashion house. Facing Via Condotti and the Piazza di Spagna, the Palazzo Fendi, a 17th century masterpiece, maintains the heritage of its historic Italian architecture while boasting a state-of-the-art space designed for an exceptional staying experience. 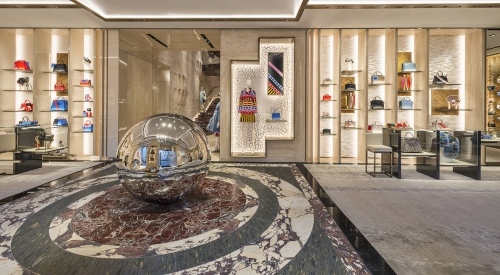 A redefined Fendi boutique covers the first and second floor of this new establishment. The boutique offers a definitive visual experience, displaying a selection of artistic pieces in a lavish architectural background that symbolises Italian luxury. The Moon Baal sculpture by Swiss artist Not Vidal is seen at the entrance of the store, inviting visitors to experience the spherical pattern of the precious marble floor. Travertine is used in the décor as a tribute to the stone’s extensive use in building traditional Roman monuments. Exclusive handbags are at display in the Baguette Wall along with special decorative objects made out of fur. The spaces dedicated to exhibiting men’s and women’s ready-to-wear are made with elements reflecting Fendi’s symbolic style. The boutique also features a Fur Atelier, which can be accessed via a glass elevator highlighted with silver leaf elements. This space makes up for a one-of-a-kind experience as the customers are invited to watch Fendi’s in-house fur artisans at work, who provide a made-to-order service and execute special orders for the customers. Palazzo Fendi’s second floor features a private apartment named The Palazzo Privé that caters to VIP clients, celebrities and friends of the luxury Italian fashion house. It was designed by the duo who designed Dimore Studio, corroborating classic design pieces with modern-day furniture items and objets d’art along with distinguished creations by Fendi. 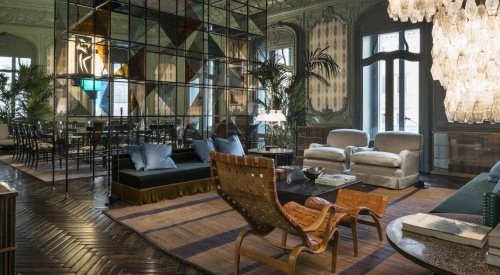 The third floor of Palazzo Fendi features the first ever hotel by the fashion house. Fendi Private Suites features seven different suites, each unique and excellent in their own way. They offer a captivating experience into the sophisticated Fendi world. The hotel features two palazzo suites, three deluxe suites, a junior suite and a Master suite situated at the corner of the third floor. All the suites offer breathtaking views of the city of Rome. The experience is wonderfully completed with the Zuma restaurant and a rooftop terrace with a bar. If you would like more detailed information on the new Fendi Hotel, please visit their website.